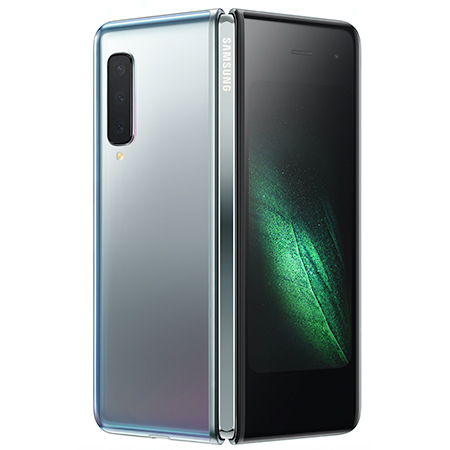 The Samsung Galaxy Fold features an industry changing 7.3-inch Infinity Flex Display, which folds into a compact device with a 4.6 inches HD+ Super AMOLED Cover Display. Multitask like a pro, on the Galaxy Fold’s Multi-Active Window. You’ll be able to run three apps at once and the App Continuity System will seamlessly adjust these apps when you move between tablet and phone modes. Designed for one handed use, the Samsung Galaxy Fold brings to life new experiences and possibilities years in the making. The innovative folding display on the Samsung Galaxy Fold does not merely bend, it folds. The display is around 50 percent thinner than the typical smartphone display and folds in an intuitive motion to open smoothly and naturally, like a book. Closing flat and compact, the Samsung Galaxy Fold is engineered with a sophisticated hinge with multiple interlocking gears. This system is housed in a hidden enclosure for a seamless and elegant look. Samsung’s Galaxy Fold is more than a mobile device. Pair with Samsung DeX2 to open the world of opportunities, with more productivity power on a PC-like experience. Enjoy the personal intelligence functionalities of Bixby, the security of Samsung Knox, the convenience of Samsung Pay ad the safety of Samsung Health. The Samsung Galaxy Fold disrupts the Mobile Photography market, offering a ground breaking six lenses. There’s three in the back (16MP Ultra Wide Camera,12MP Wide-angle Camera, 12MP Telephoto Camera), two on the inside (10MP Selfie Camera, 8MP RGB Depth Camera) and one on the cover (10MP Selfie Camera). The Galaxy Fold camera system has flexibility built in. Galaxy Fold introduces a new level of multitasking, allowing you to use other apps during a video call. Samsung have equipped the Galaxy Fold with everything it needs to ensure everything runs smoothly, even when running three apps simultaneously. Powered by a high-powered, next-generation AP chipset and 12GB of RAM with PC-like performance, with a sophisticated dual battery system was specifically engineered to keep up with you. The Galaxy Fold is even capable of charging itself and a second device simultaneously via Samsung’s Wireless PowerShare. Contents are predicted and are subject to change on release.